Our Design Team consciously creates and designs garments with timeless silhouettes that outlast passing trends. We select and source only high quality fabrics that contribute to the longevity of Trelise Cooper designs and each piece is made carefully to meet our exacting standards. In the past five years we have deliberately reduced the size of our collections and sample ranges to less than half the previous size to minimise waste. We design with awareness, responsibility and a deep passion that requires an emotional connection. The consequence is our customer wants to treasure the garment forever. We manufacture a limited number of each style which means our customers have something unique to enjoy. Our intention in design is these garments are made to cherish and become legacy fashion pieces passed down through generations. Many of our pieces feature delicate beading and embroidery which we as a brand are known for. This ancient heritage handwork and beading is done by passionate artisans and is a dying and rare art that we as a company place great value and regard in. We look forward to introducing more of them into our ranges as technology continues to develop in this area. Trelise Cooper has been an early adopter of the exciting new sustainable initiative that is the garment rental boutique. 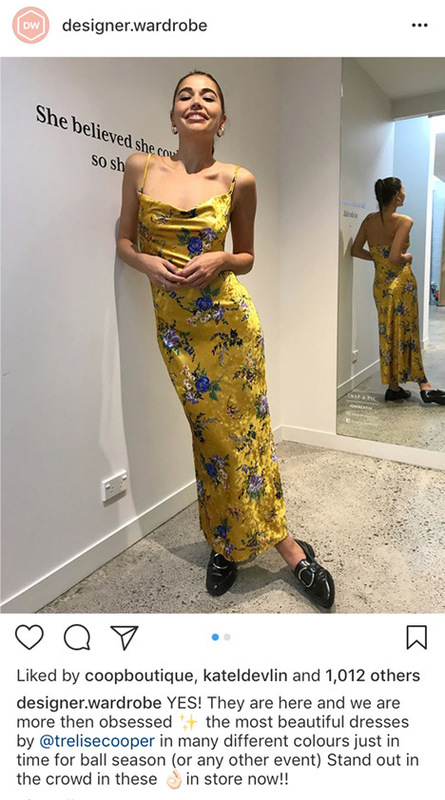 We have supplied to rental boutiques throughout New Zealand and Australia for several seasons now and are delighted to have new customers enjoying our garments in this way. This renewable proposition has grown every season. It contributes significantly to the lifespan of the garment and is a responsible way forward for the fashion industry. Rental boutiques have the power in the future to transform fashion. We work to minimise offcuts in our design process but any offcuts are upcycled to Schools, Hospices and various other charities who in turn use it to create garments and products for other causes. Excess fabrics/old season fabrics are given to Fashion Students, High Schools, and new business start-ups. We also give our fabric offcuts to Early Childhood Centres for art projects. We offer at no cost our unused fabric rolls to up-and-coming Fashion Designers and Fashion Students at Universities and Polytechs in the community.